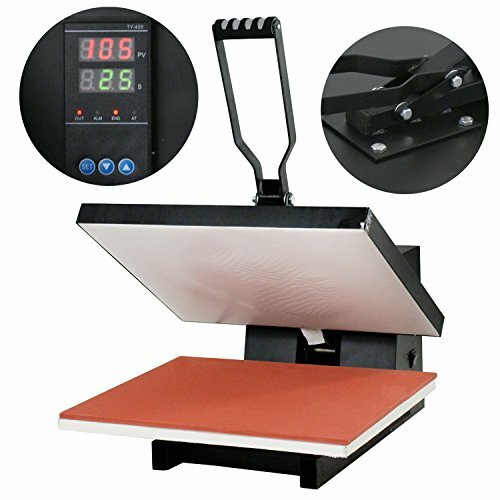 Solid steel welded framework, scratch-resistant, Intelligent digital time & temp control panel with memory function, Automatic countdown and alarm,Good in heat transfer printing on t-shirt, bags, puzzles, mouse pads etc. The machine adopts the new generation "K" type control cabinet circuit board & chip ,which makes the power more stable and troubles of breakdown circuit board caused by unstable voltage are avoided. Working table: 16" x 20"
3. Aluminum heat plate, Heating uniformity on the surface. 4. Teflon coated on the heat plate , convenient and attractive appearance. 5. Signal indicator when transfer press over . 9. 70 open of heating plate, convenient for operation very much. Upgraded and thickened aluminum plates make it safer and avoid troubles of uneven base board and carrying capacity. The upgrade of quality, material and technology further enhances the quality.It can be lifted, lowered and rotated by 360 degrees, which makes putting and taking printing articles easier as well as replacement of different transfer parts.The base board of foaming silica gel withstands high temperature up to 400 degrees.